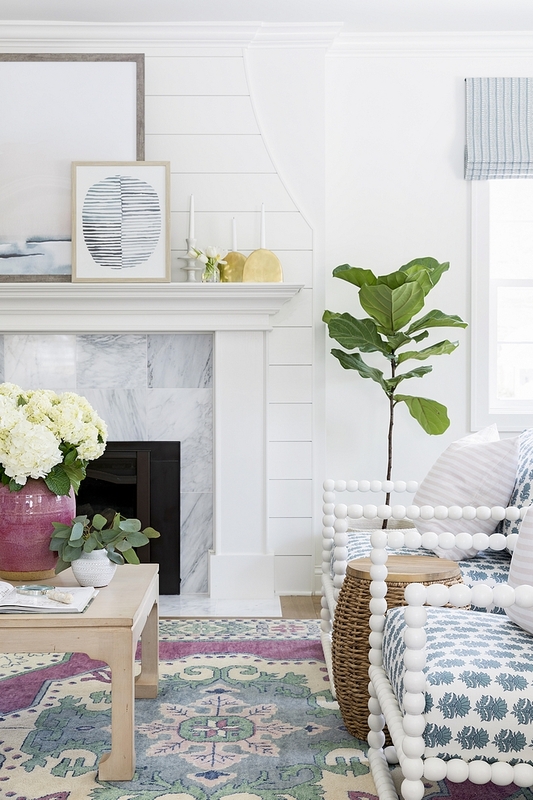 Today on our Interior Design Ideas series I am sharing a very sweet and dreamy little bungalow. 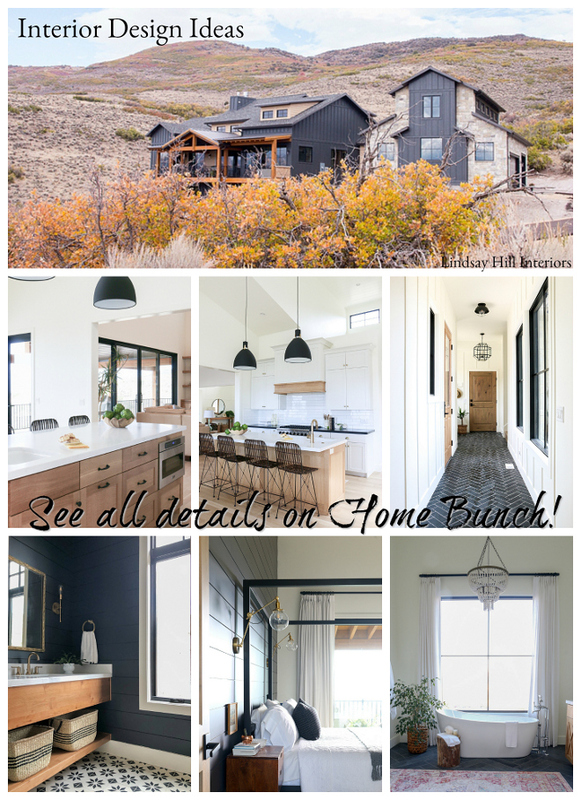 Designed by my friend Bria Hammel of Bria Hammel Interiors (who’s been featured many times on Home Bunch: here, here & most recently here), this home had great bones to start with, so the interior designer focused on functional layouts and all the little design details that would bring this home to the next level. 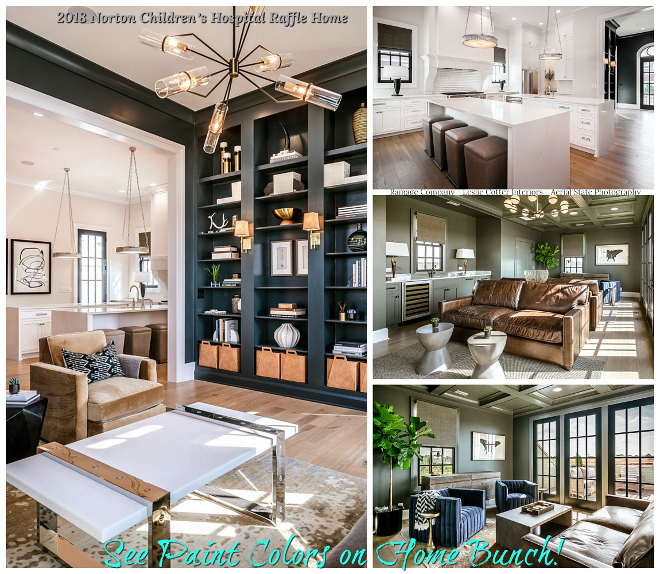 The clients had no problem when it came to using color and pattern which made the job that much more fun. Save your favorite pictures and have a relaxing time, everyone! 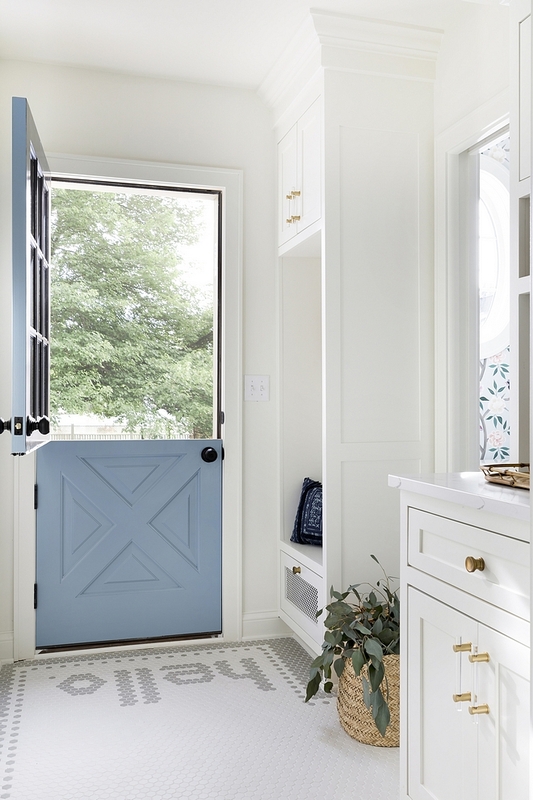 You had me at hello… 🙂 Blue Dutch Door paint color is Denim Wash by Benjamin Moore. 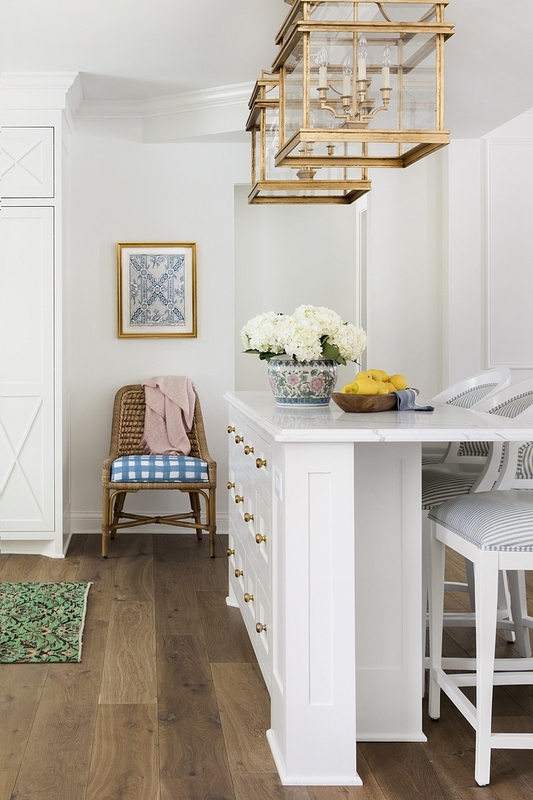 Flooring: 1: Hex Tile in White. Tile 2: Satinglo in Light Smoke. Similar Pillows: Denim: Here, Here, Here, Here. Solid: Here, Here, Here, Here, Here & Here. 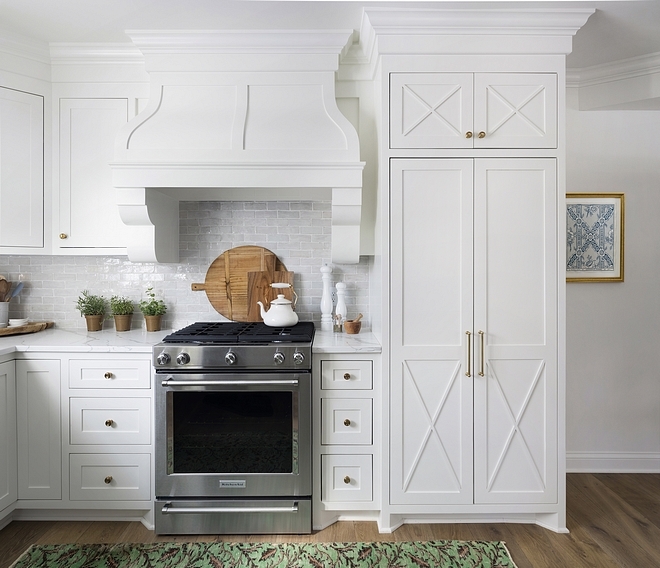 These custom cabinets feature shiplap and quatrefoil insets. Notice the drop zone passing the powder room. 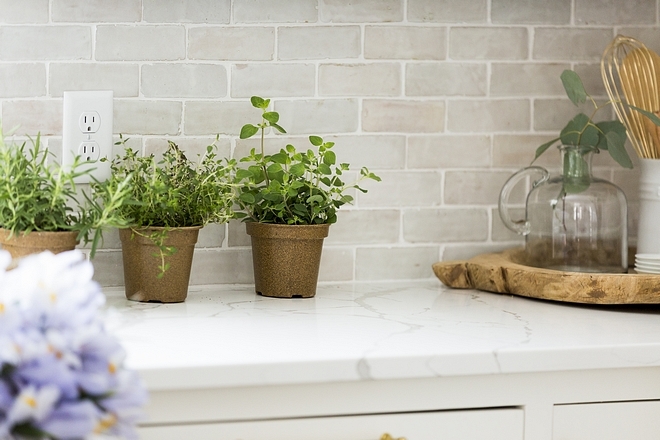 Countertop is a marble-looking quartz; Calacatta Laza. Beautiful Small Vases: here, here, here, here, here & here. Rug: Soleil Rug by Caitlin Wilson – similar here (70% off). 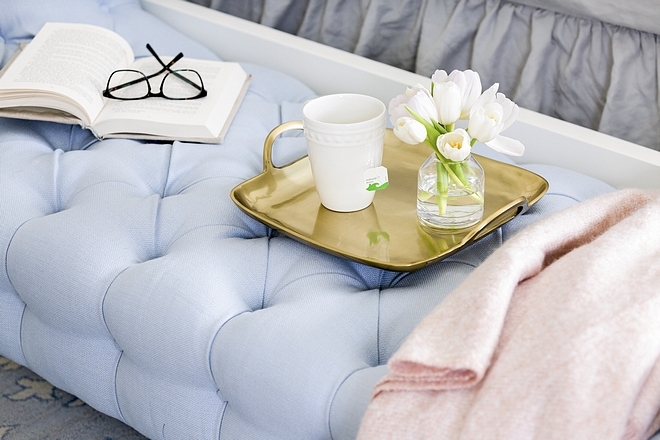 Ming-Style Feet Coffee Tables: Serena & Lily & here. Beautiful Sofas: Here, Here (I love this one! ), Here, Here, Here, Here, Here, Here, Here, Here & Here. Similar Sofa Pillows: Blue, Esmerald Velvet. Fiddle Tree: Here, Here, Here & Here. Fireplace features curved millwork with shiplap paneling and Carrara marble tile. 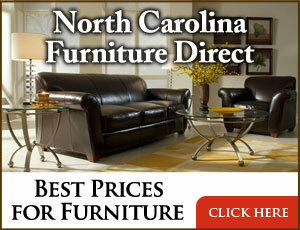 Similar Spindle Chairs: here, here, here & here (natural). 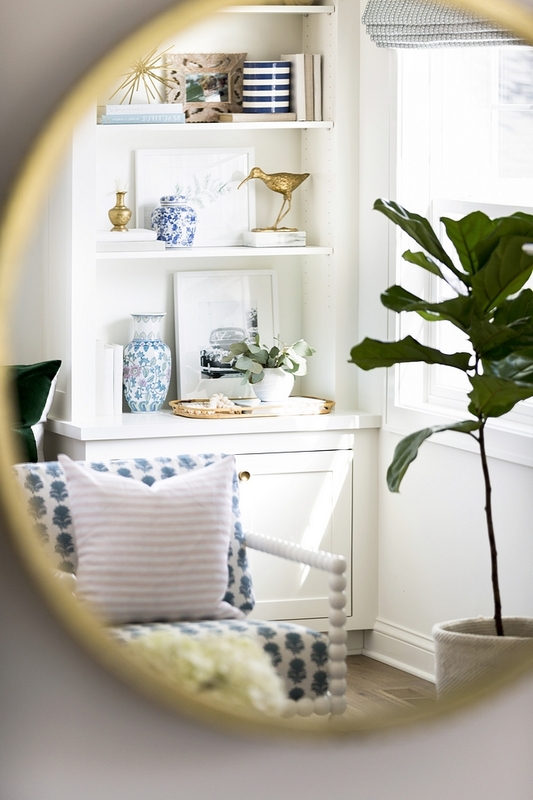 Rattan Side Tables: Here, Here, Here, Here & Here. 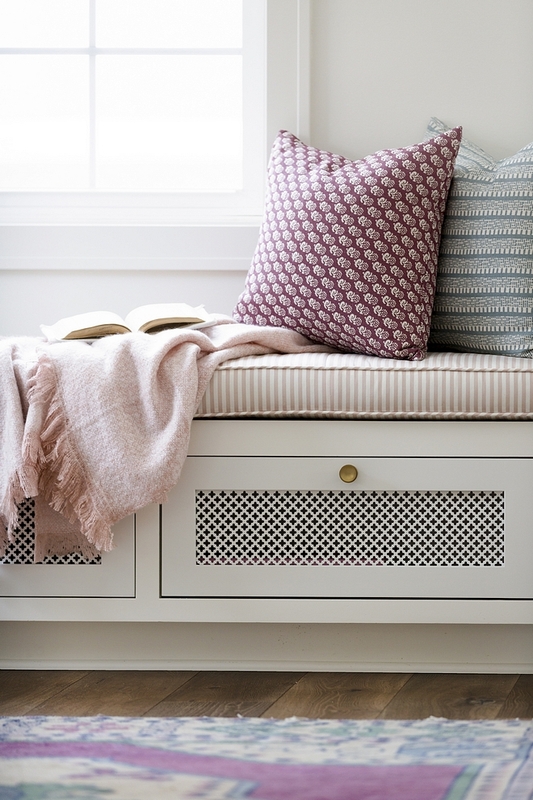 Blush pink striped pillow: here & here. 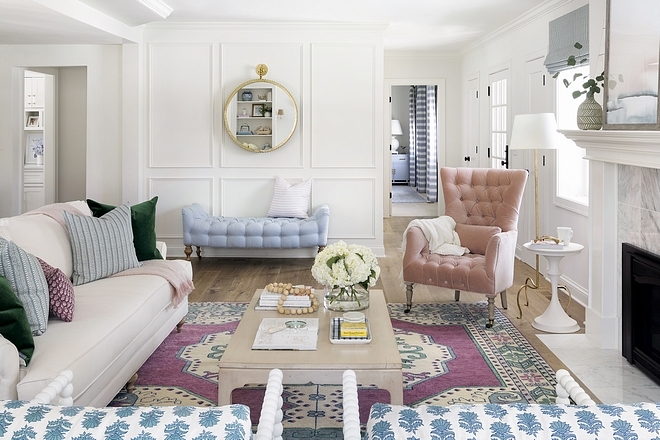 The furniture layout of this living room invites you to sit and enjoy the space. 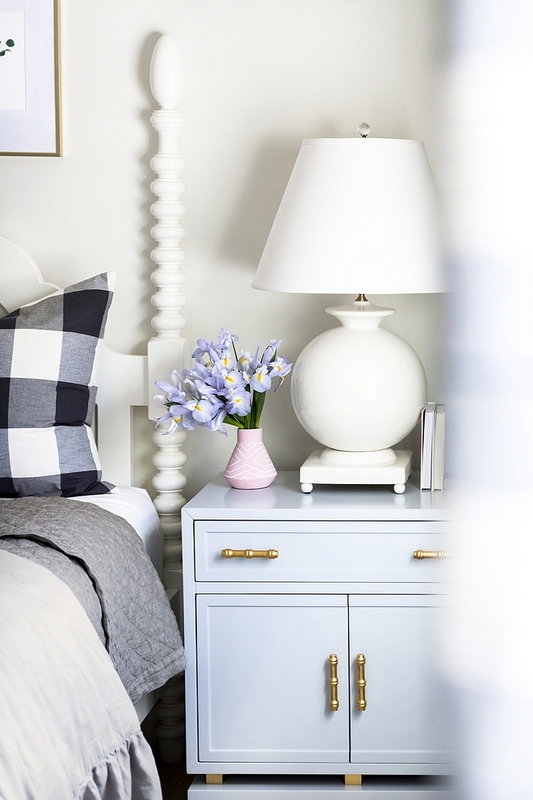 Similar Floor Lamp: Here – Other Affordable Lamps: here, here, here & here. 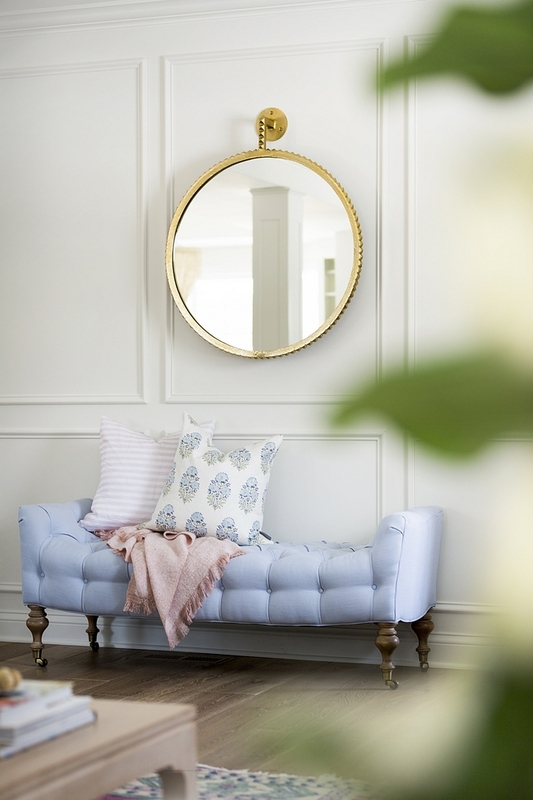 Blush Pink Velvet Chair: Julienne Chair – Fabric: Velvet, Rosewater. 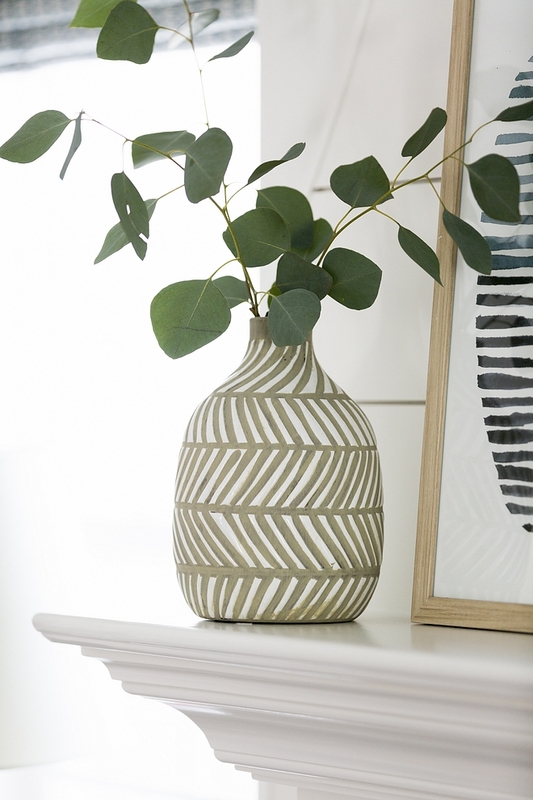 Vase: Wayfair. (Pitcher with same design: here). 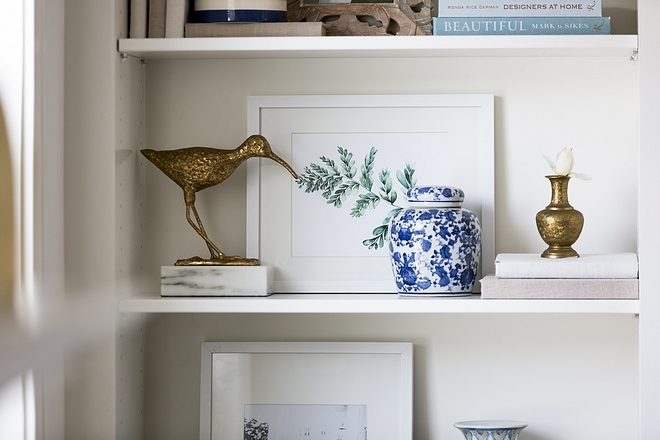 See more beautiful vases here, here & here. 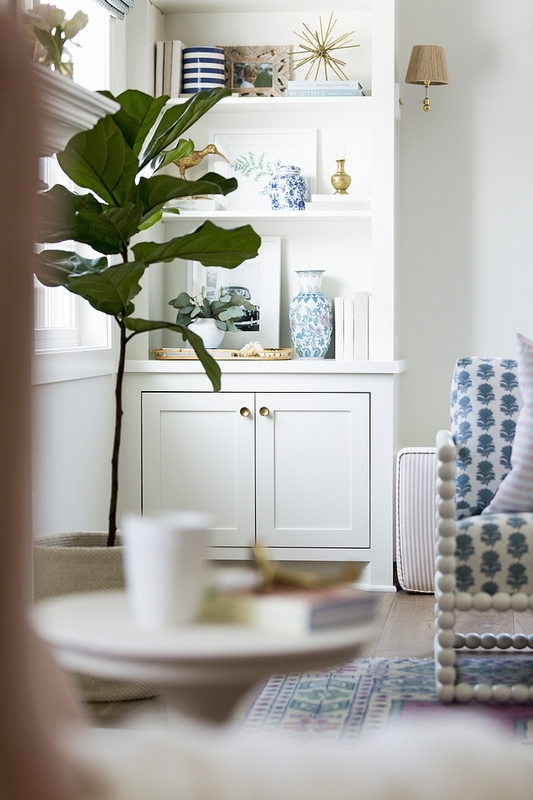 I love the idea of adding a window-seat on the other side of the living room (instead of flanking the fireplace). This expands and balances the room. Beautiful pottery can be found here. 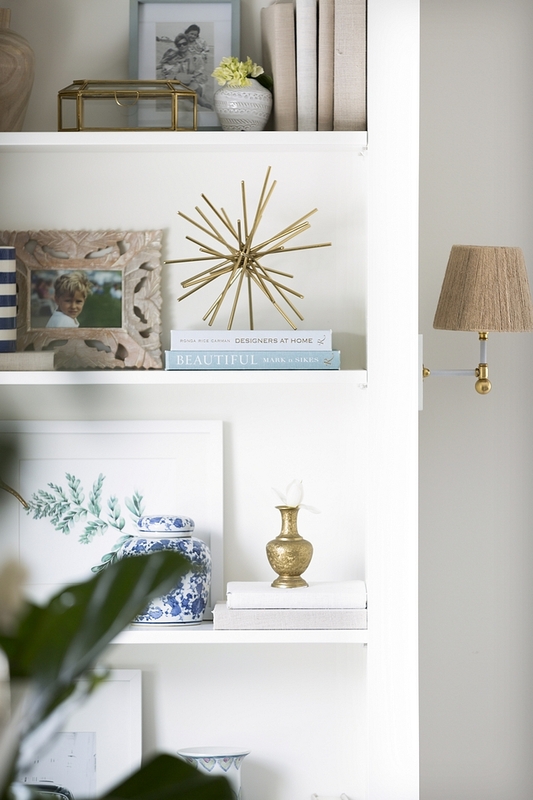 Sconces are Ro Sham Beaux Piper Sconce in Brass. 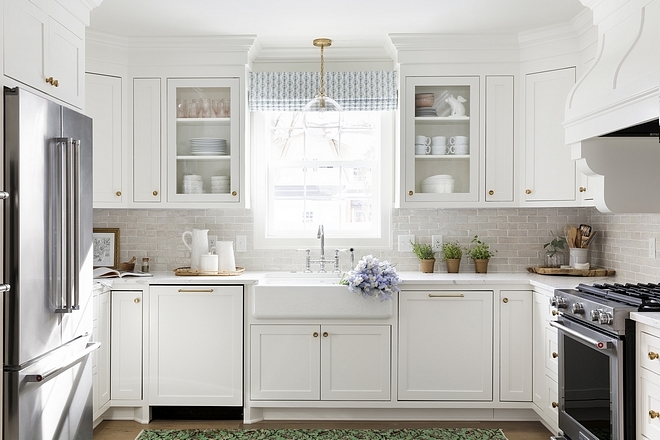 Lacquered Cabinet Paint Color: White Dove by Benjamin Moore, Satin. 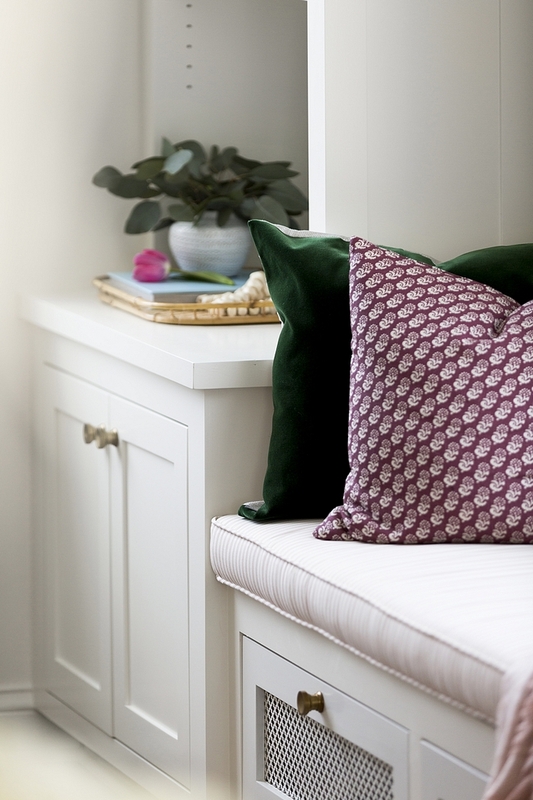 Green Velvet Pillow: McGee & Co.
Millwork: Benjamin Moore White Dove in Satin finish. Bench: Bruno Bench in Sky by Serena & Lily. 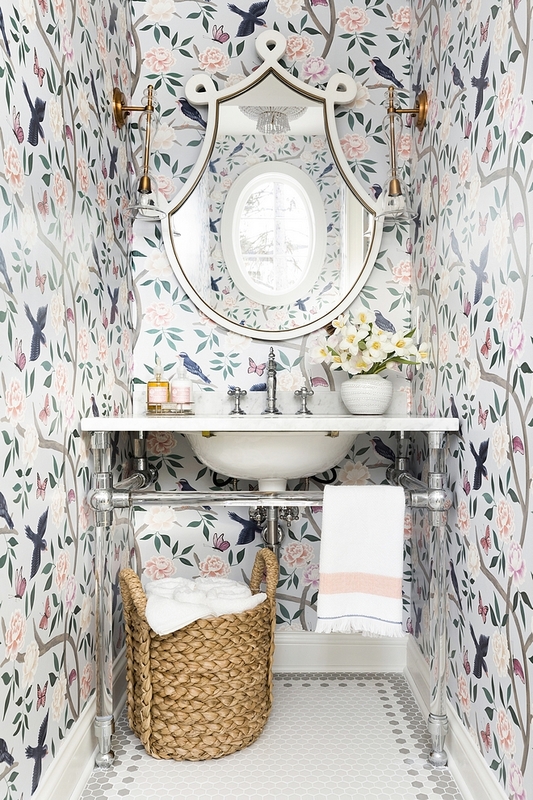 Gorgeous color scheme! 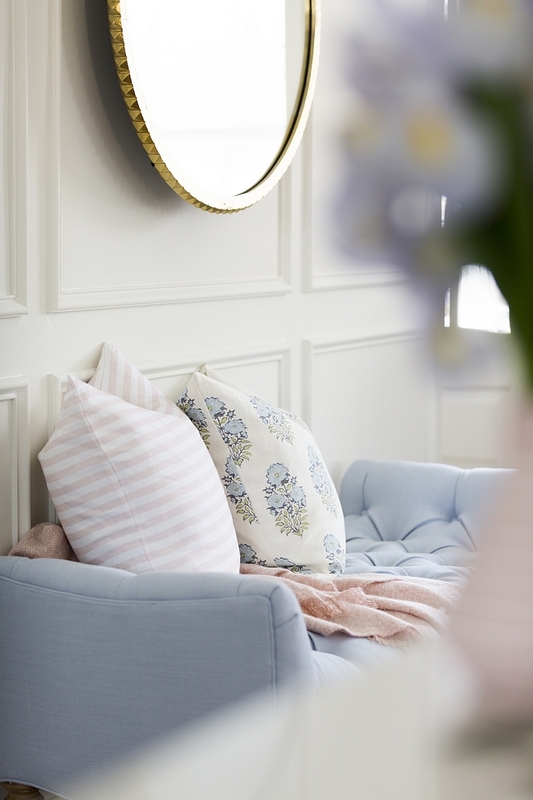 Blush pink pillow can be found here and floral pillow here – similar here. Pastel Pillows: here, here, here, here, here, here & here. 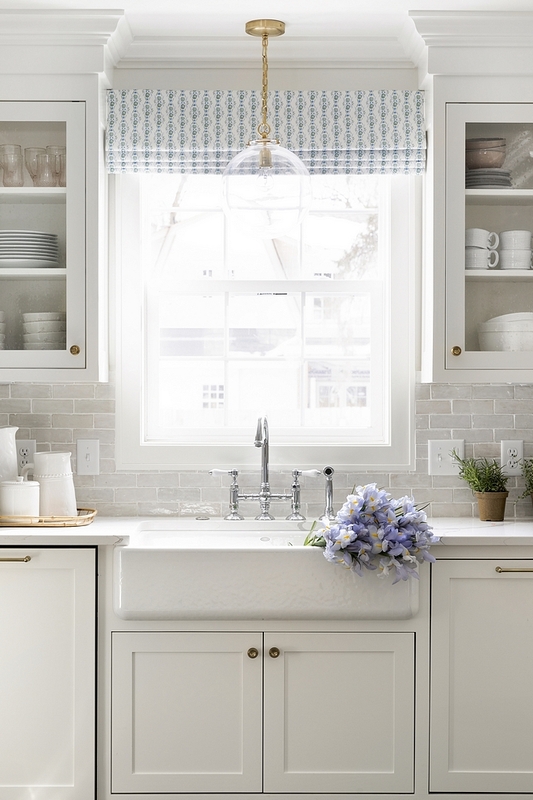 This white kitchen is on the small size but it’s beyond beautiful! 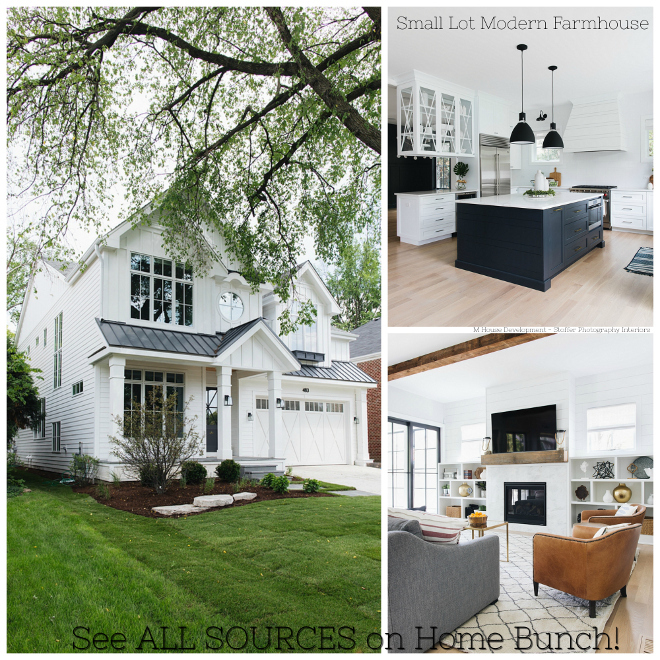 I love the white cabinets, the pale grey backsplash tile and the wide plank hardwood floors. Lighting: Visual Comfort in Gilded Iron. 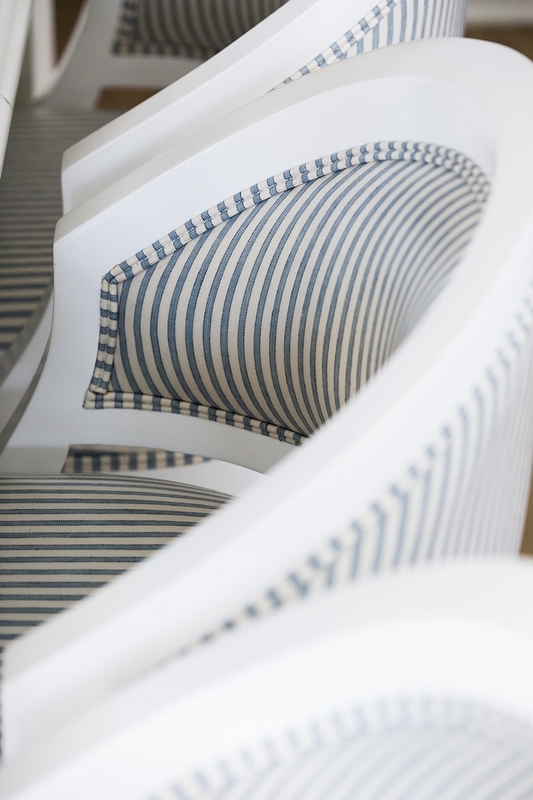 The white counterstools with striped blue and white fabric are custom. 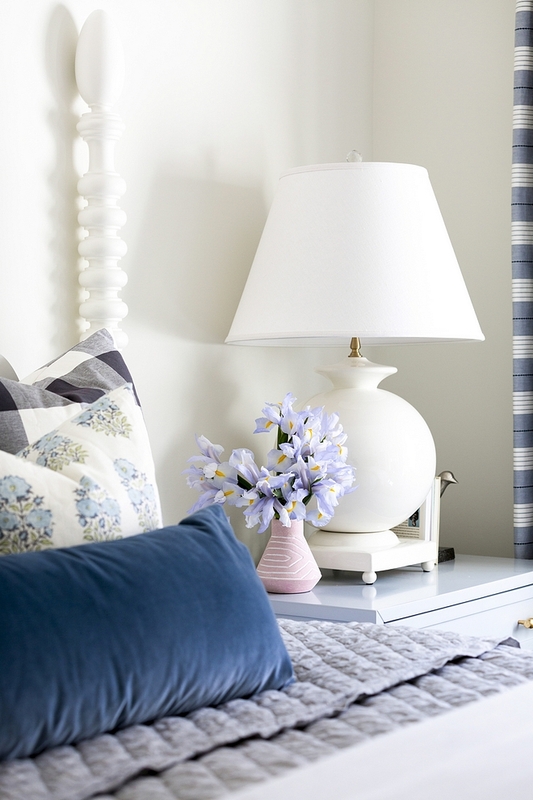 You can find a beautiful blue and white striped counterstool here. 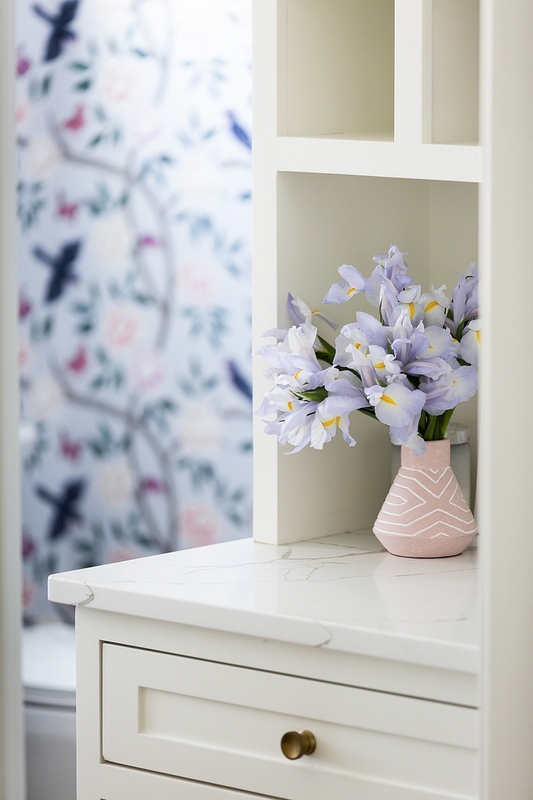 Countertop is Calacatta Laza – Quartz. 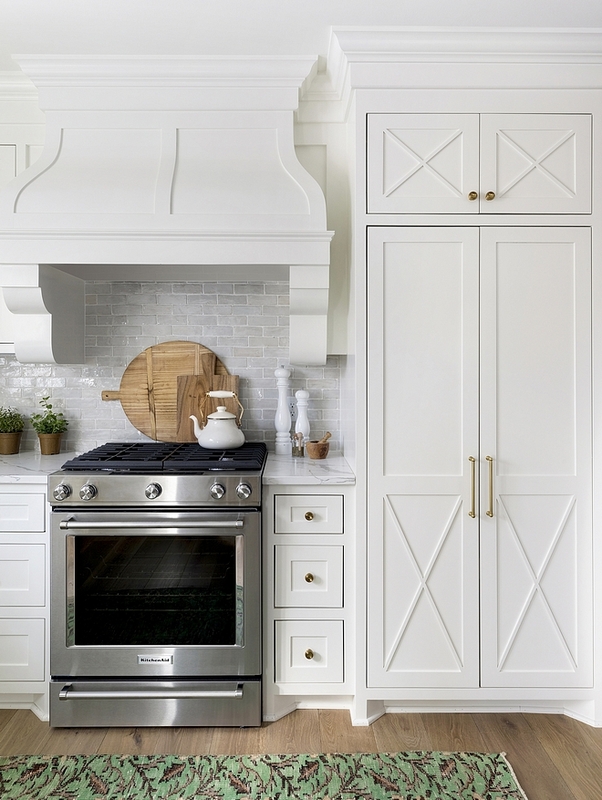 Kitchen Cabinet Style: Paint grade, inset, flat panel doors with custom x door insets. 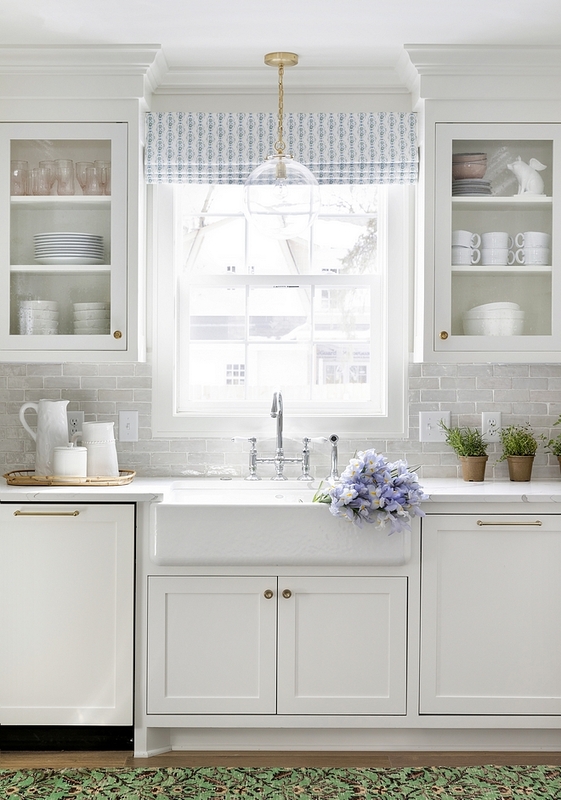 Most Popular White Kitchen Paint Color: Benjamin Moore OC-17 White Dove, Satin. 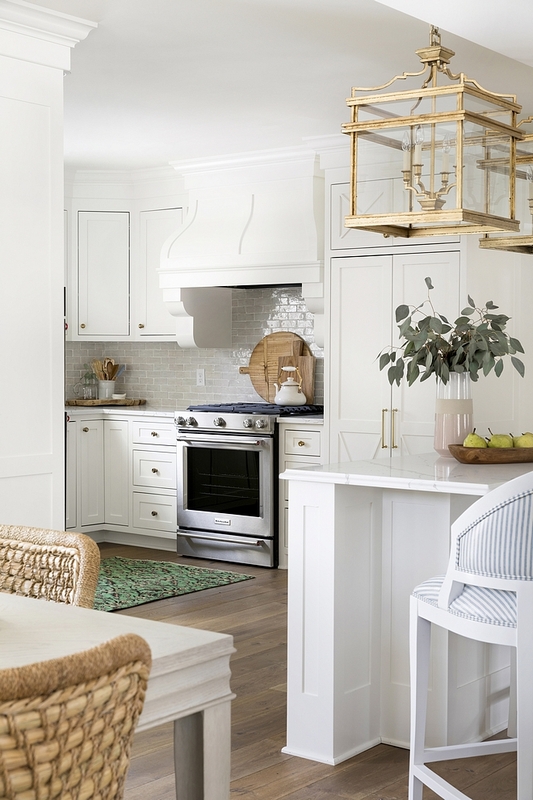 Kitchen Backsplash: Glazed terracotta Subway Tile – Zellige Weathered White Subway Tile – similar here, here (weathered white) & here (pale grey). The dishwasher is paneled and it’s located on the left by the kitchen sink. Kitchen Window Roman Shade – Sara by Lulie Wallace. 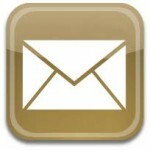 Lighting: Visual Comfort & Co. Antiqued Brass – Sconce can be found here. Kitchen Faucet: Rohl Two Handle Kitchen Faucet in Polished Chrome. Kitchen Sink: Kohler –in White. 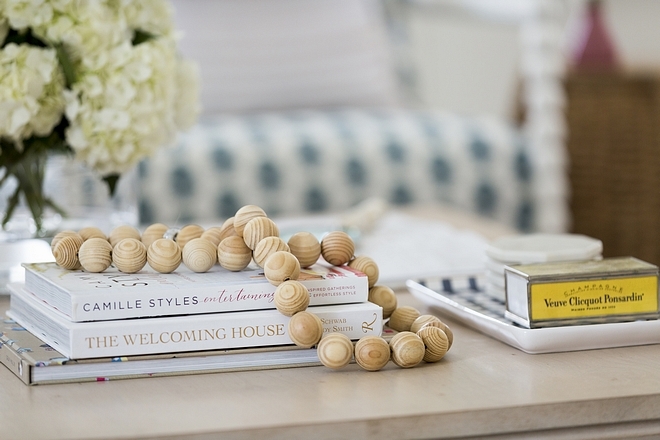 Hardware: Knobs: Gilmore Knob in Aged Brass (Restoration Hardware). 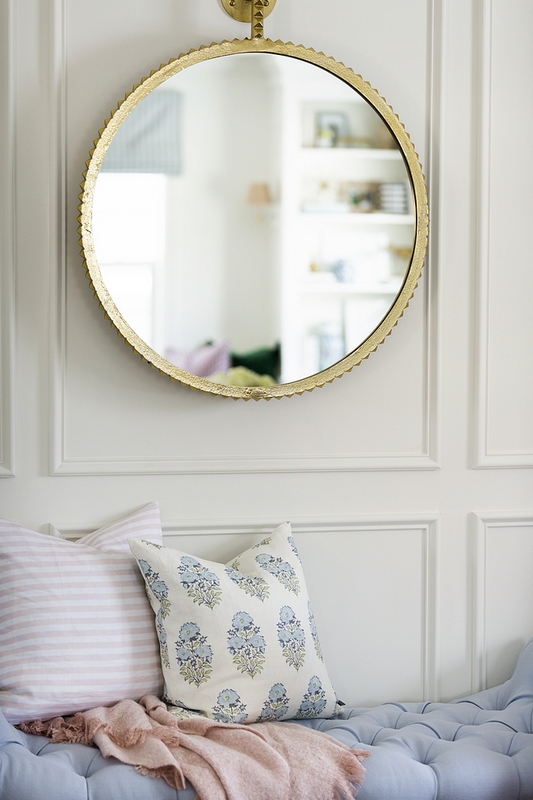 Pulls: Chatham Pull in Aged Brass (Restoration Hardware). 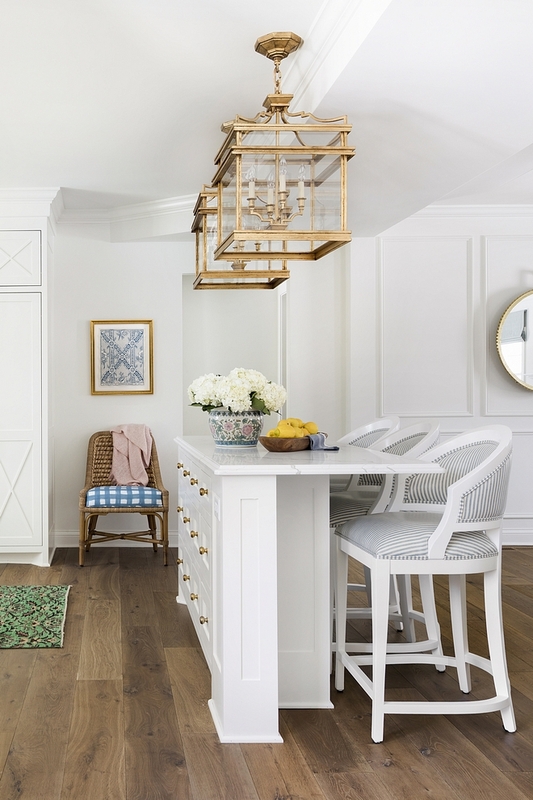 Hardwood Flooring Throughout the House:Hallmark Floors Alta Vista in Malibu 7.5” – similar here. Dining Chairs: Capitola Armchair by Palecek with custom fabric – similar here. Dining Table: California Dining Table in Malibu by Universal – similar here. Other beautiful dining tables: here & here. 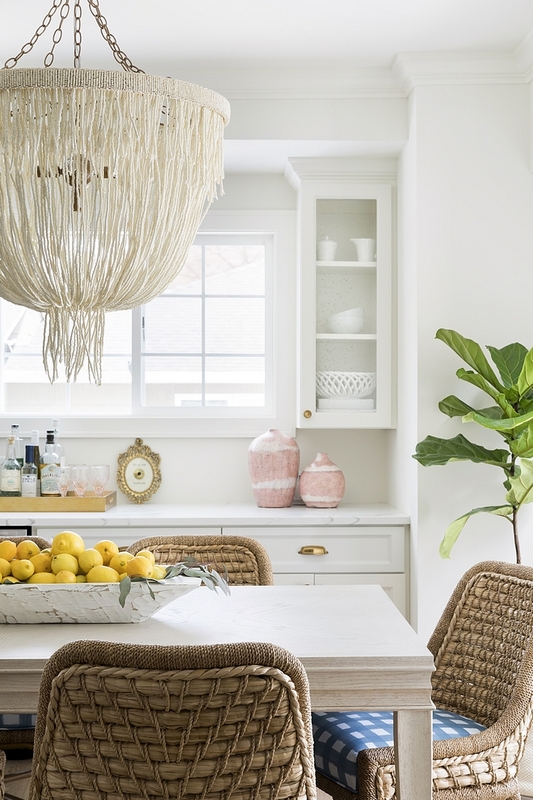 Chandelier is Carmen Chandelier by Madegoods – similar here, here, here, here & here. Wall paint color is White Dove by Benjamin Moore, Flat. Similar Fiddle Tree: Here, Here, Here & Here. Washstand: Restoration Hardware Gramercy Glass Washstand – similar here. Wallpaper: Soft Blue Chinoiserie Wallpaper by Caitlin Wilson – similar here & here. (Pillow: here). Faucet: Kohler in polished chrome with cross handles. Mirror: Bartlett Mirror by Gabby. 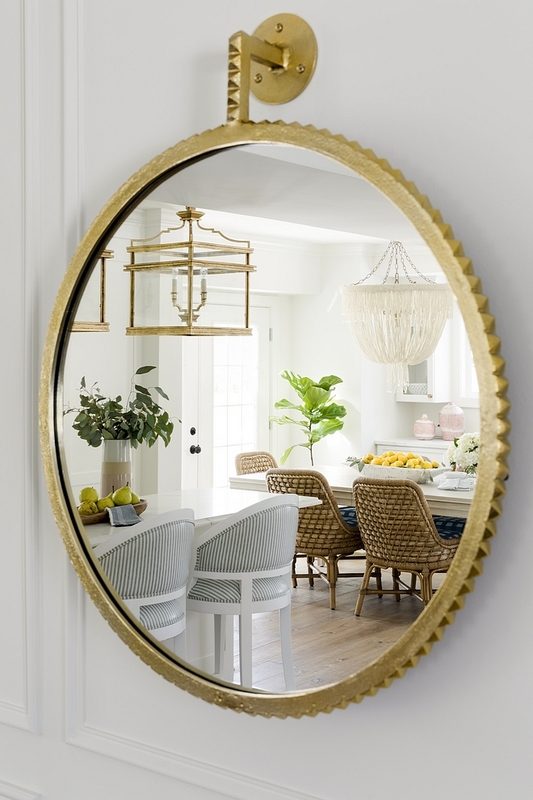 Lighting: Anthropologie Vetro Sconce in Brass – similar here. Floor Tile: Tile 1: Satinglo in Ice White. Tile 2: Satinglo in Light Smoke. Basket: here, here, here, here, here, here & here. 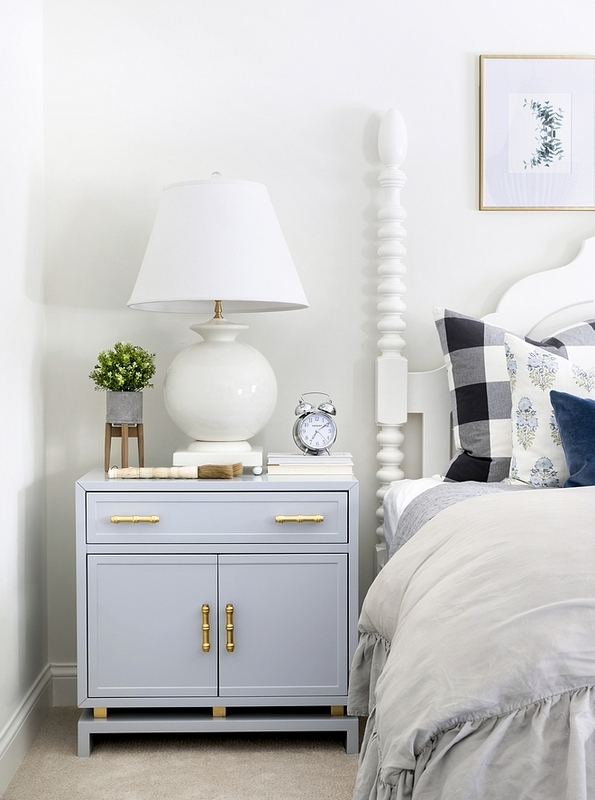 The master bedroom features white walls, painted in Benjamin Moore White Dove OC-17, and a soft blue & white and grey color scheme. 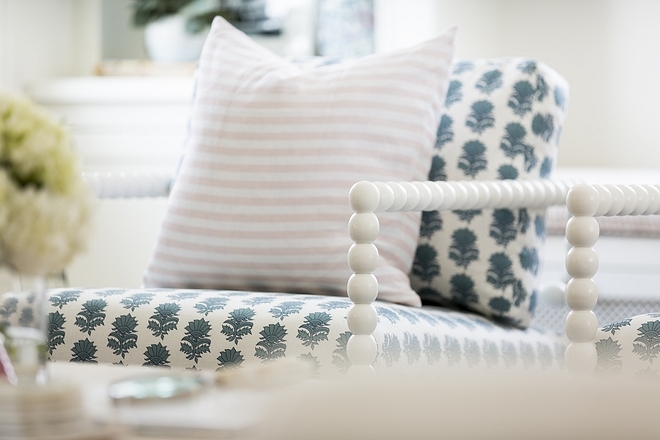 Bench: Serena & Lily – Fabric: Sky. 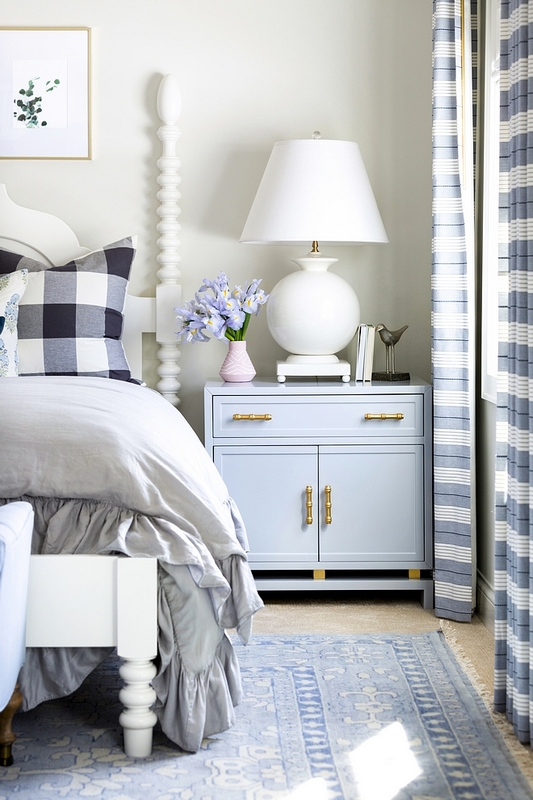 Drapes – Audrey Stripe by Schumacher – Beautiful Striped Drapes: here, here, here, here, here & here. Grey Linen Duvet Cover: Here. 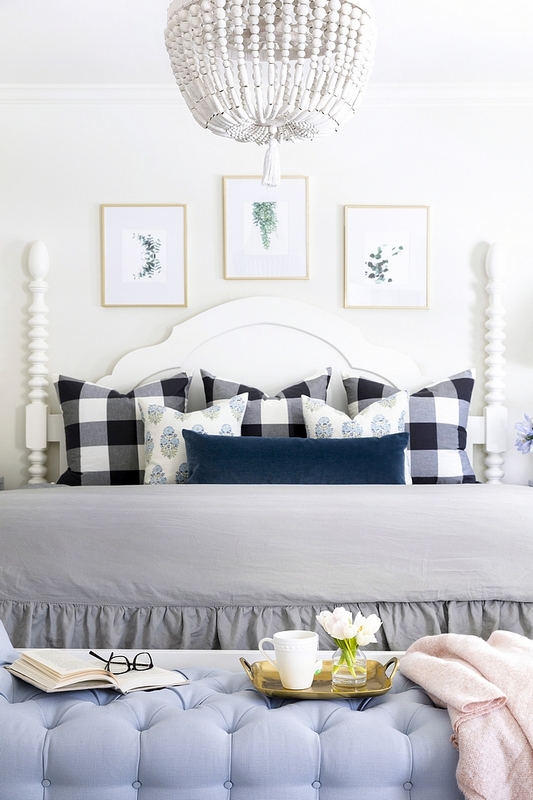 Check Pillows: Caitlin Wilson Black Burnside Buffalo Check Pillow. 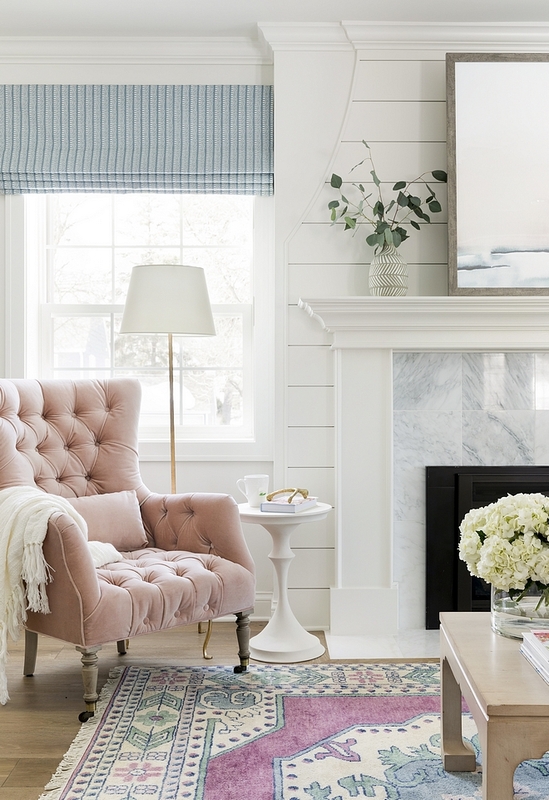 Similar Blush Pink Throw: Here. Similar Artwork: Here, Here, Here, Here, Here, Here & Here. 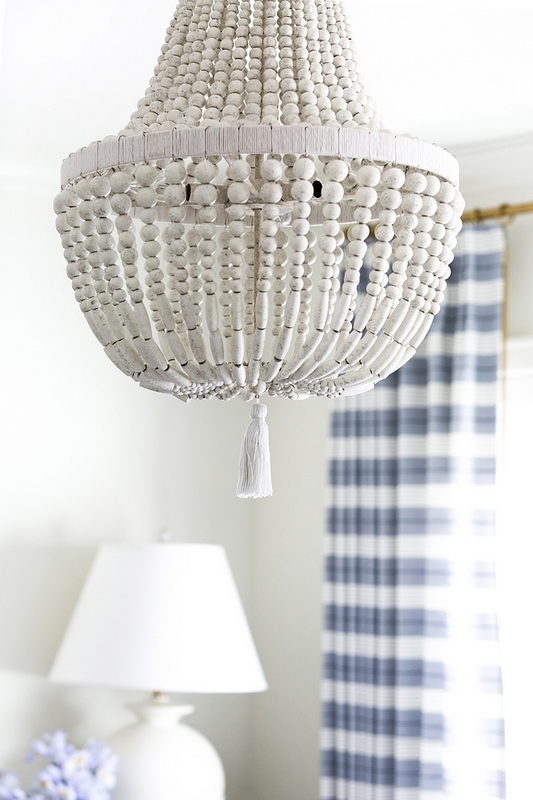 Master Bedroom Chandelier: Dauphine Wood Empire Chandelier in Weathered White – similar here. 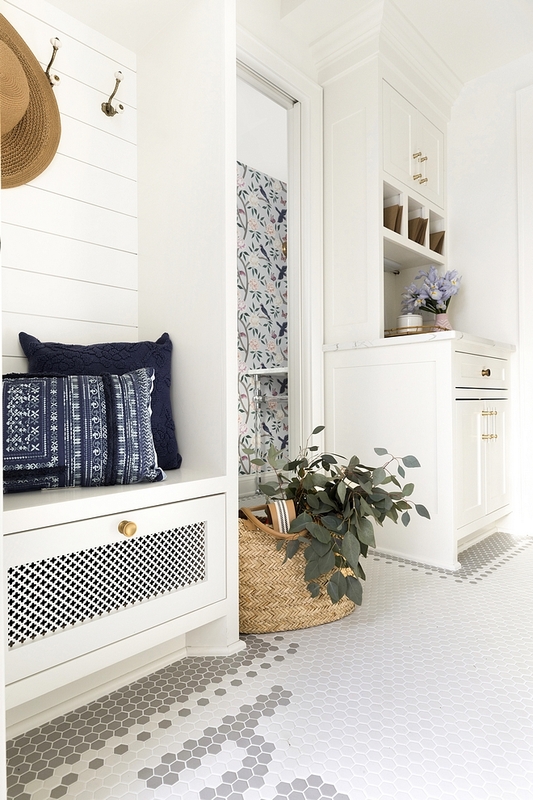 Blue Rug: Emma Rug by Caitlin Wilson – similar here. Blue Velvet Lumbar Pillow: Here & Here. Nightstands are World’s Away in Grey. Flooring: Dreamweaver carpet in Santa Monica Eggshell. 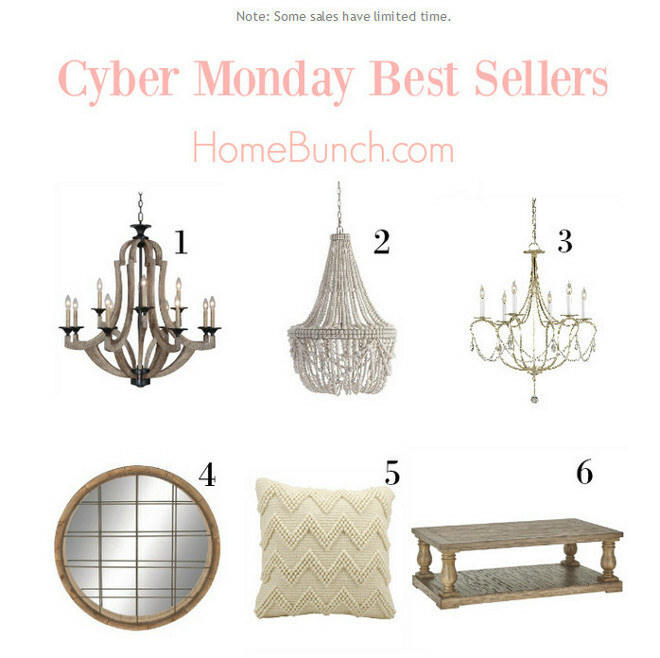 Beautiful decor can be found here. 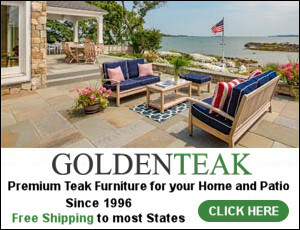 Pottery Barn: End of Season Mega Sale!!! Up to 70% Off! West Elm: Up to 75% OFF End of Season Sale! Pier 1: Huge Christmas Decor Sales – Up to 60% Off! 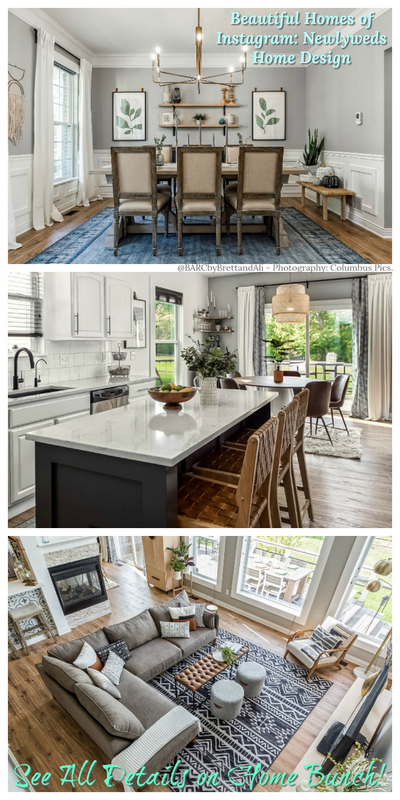 Kitchen and Bathroom Reno – New Renovation Ideas for 2019.